« Henna isn’t just for redheads…or wannabes! Free class! New Moroccan Henna, a photo by kenzilicious on Flickr. This is a quickie, late-night henna I did with some new henna I just got. The henna will be available soon and I think you’ll love it: quick release, mixes into a smooth, creamy paste, goes on like a dream and stains rich and dark. More on that soon. The design is pretty typical Moroccan of my own creation. I felt very inspired using this yummy new henna from a new supplier; I wanted to cover my entire body with Moroccan henna designs. Unfortunately it was late! I’m still working on getting this henna out to the public; I want everything to be perfect. If you want to be notified when this henna powder is released, follow me on twitter @moorhenna. This entry was posted on June 20, 2011 at 1:13 pm and is filed under Uncategorized. You can follow any responses to this entry through the RSS 2.0 feed. You can leave a response, or trackback from your own site. Phwoar! Look at that colour!! I am very, very interested in this henna. Is it Moroccan? Yes, definitely Moroccan. It’s super fresh because it’s ground and sifted when I order it. It will be available soon. In my tests I’m really loving it. The photo is of henna left on overnight but washed 2 hours after removing the paste. I usually try to keep water off it but I had to shower and run to an appointment. I will try to do another test where I don’t get it wet so soon after paste removal. Hi, I love your Moroccan designs, they are fantastic! I am a henna artist too from Malaysia and It would be great you could help me enhance my skill in Moroccan art. I would like to know the symbols, and what really makes Moroccan designs so different. It looks all geometrical but I am never satisfied with mine. I would also like to include the history behind Moroccan henna and I can’t get valid information as the ones from the internet may be unreliable. Wow very nice. I love the look of this new henna. 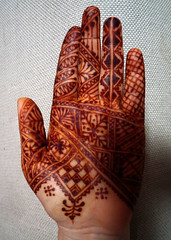 I also have a henna blog, http://www.mehndiequalshenna.com please come and take a look. I am so happy to discover your blog and book. I have always thought henna/mendhi was the most beautiful form of body art, even though I don’t have many opportunities to have it done myself. =( But I think I also have a romantic attachment to henna because I have some Moorish ancestry. I am wondering what you think about permanent tattoos that are done to resemble henna (using red-brown/orange inks to make henna designs on the hands/feet). Does it defeat the purpose of henna as an ethereal art form, or is it simply another way to express beauty and joy? Would love to hear the thoughts of a henna expert! Thanks so much for your compliment. I think all art is temporary as it can fade from memory or from view, even as it still exists. I also believe that the magic of henna is multidimensional because part of the art is the experience of having it applied or applying it, and then there is the dimension of the art as the paste, and then the art as stain, and then the art as it fades. Then it all becomes a memory just liking having seen a painting in person but retaining that in your mind’s eye.